One Fine Thread is a collection of talks written by Kitty Davy between 1968 and 1990. It will come as no surprise that they are dedicated to the one subject that comprised the entire focus of her life, namely, Avatar Meher Baba, her spiritual Master, whom she loved and followed since their first meeting in London in 1931. These talks were given mainly at Meher Spiritual Center, in Myrtle Beach, South Carolina, where Kitty lived from 1952 until her death in 1991 at age 100. Born in London, Kitty L. Davy first met Meher Baba on his initial visit to the West in 1931. From that day until the present time, she has led the always challenging life of one of his close disciples. One of the few disciples to whom Meher Baba accorded the privilege to “leave all and follow me,” Kitty Davy spent the next twenty years in Meher Baba’s company, briefly in Europe and later for a long period in India. 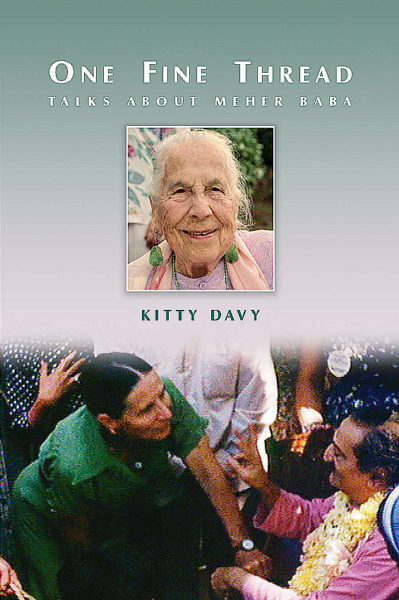 In 1952, Meher Baba brought Kitty Davy to America and by his wish she remained to help with the running of the Meher Spiritual Center in Myrtle Beach, South Carolina. She continued this work with enthusiasm, vitality and love, inspiring those who knew her up until her death December 3, 1991.